Recent release “RELICS - A Myth You Don't Believe - A Reality You Won't Survive” from Page Publishing author John Vandeventer is a visceral page turner about an ancient horror resurfacing to plague a small town in Southern Oklahoma. John Vandeventer, a sixteen-year Air Force veteran from Plano, Texas who now lives in Brashear, Texas, and has interests in target shooting and military aviation history, has completed his new book “RELICS - A Myth You Don't Believe - A Reality You Won't Survive”: a captivating tale that is the author’s first book – the fruit of his newly discovered hobby of writing. Published by New York City-based Page Publishing, John Vandeventer’s intense novel features a thrilling narrative that uncovers history piece by piece as Samuel, the town’s chief of police and the book’s main character, discovers a foreboding secret of monstrous proportions. 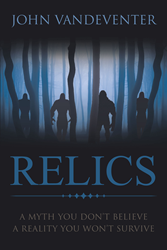 Readers who wish to experience this intriguing work can purchase “RELICS - A Myth You Don't Believe - A Reality You Won't Survive” at bookstores everywhere, or online at the Apple iTunes store, Amazon, Google Play, Kobo, or Barnes and Noble.